This entry was posted on 2nd September 2016 by admin. Congratulate & celebrate a new arrival with this personalised wall print which will make a thoughtful impression. It comes with the option to be sent with a frame or unframed as you prefer and also with a variety of prints and colours to choose from to ensure the patterns compliment. Perfect for displaying proudly in any nursery wall, play room or any other interior room. 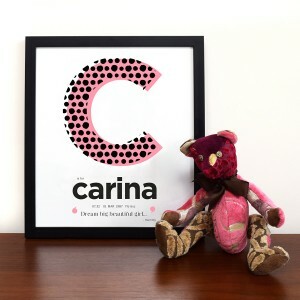 This print can simply feature the initial and name or you could add a few extra details including birth time, date and weight. There is also an option to put some wise words of wisdom to the new addition. You can create a unique, gracious gift for a new baby, 1st birthday, christening present or Christmas gift. Each wall print is made to order and is printed on high quality vinyl in a wooden frame with a glass insert. If interested simply click on the image above to view the listing and details. We have several wall print choices so be sure to view our other wall print options by going to our main menu page, selecting Home Accessories and then clicking on Wall Prints.